The final concert of the MasterclassBudapest will be held at the Celebration Hall of the National Museum on the 2nd of September at 4 pm. Tickets availabe online at the website of the MÁV Symphony Orchestra. Yesterday, the 3rd International MasterclassBudapest for Conductors has officially started. Please, check our Blog for more details, pictures and videos! Participants announced! Maestro Jorma Panula has selected 9 active participants for the 3rd MasterclassBudapest. Congratulations, see you in Budapest! We are happy to announce, that the 3rd Masterclass Budapest has attracted a record number of applications from all over the world. Now the selection process will take place. All applicants will be informed about Maestro Panula's decision via email; the list of selected participants will be published here soon. The application is now open for the Third International MasterclassBudapest for Conductors! To find all information about repertoire, venues, conditions and application form, please click About. For any further question, please use the contact form. Application deadline is 09/06/2017. +1 day! With an additional orchestral day, ​The Third International MasterclassBudapest for Conductors will be held from 27th of August till 2nd of September 2017, with Maestro Jorma Panula and the MAV Symphony Orchestra. More details will follow soon, stay tuned! We are happy to announce the 9 participants of the 2nd MasterclassBudapest for Conductors with Jorma Panula! Congratulations, and welcome to Budapest! Stay up to date and follow our blog! The application period for the second international MasterclassBudapest for Conductors is now closed. We are very happy about the great interest, and for the numerous applications from Finland, France, Italy, Germany, Austria, Belgium, The Netherlands, Norway, Romania, USA, Chile, Singapore, Taiwan, South-Korea, Japan and Australia. We will inform the applicants about the Maestro's decision by 15. 06. Stay tuned! The application is now open for the second international MasterclassBudapest for Conductors. To find all information about repertoire, venues, conditions and application form, please click About. For any further question, please use the contact form. Application deadline is 31/5/2016. The next MasteclassBudapest for Conductors will be held from 9-15th September with the MAV Symphony Orchestra and Maestro Jorma Panula. More details will follow soon! 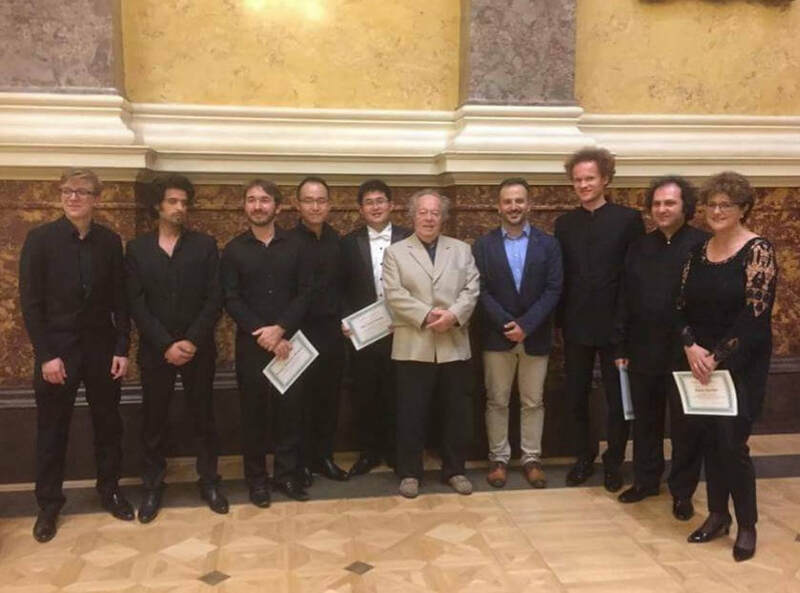 The First ​International MasterclassBudapest for Conductors was held by Maestro Ed Spanjaard and the MAV orchestra in September 2015, with students from Singapore, Germany, Canada, Japan, South Korea, Slovenia, United Kingdom and Israel. Ed Spanjaard (Haarlem 1948) studied piano and conducting in Amsterdam and London. He started his career as répétiteur at the Royal Opera House “Covent Garden” and at the Bayreuther Wagner-Festspiele. With this background, his love for opera is a fortunate consequence. Among the new productions he conducted are: Così fan tutte (with the Orchestra of the Eighteenth Century), Der Ring des Nibelungen (Dutch Touring Opera), Pelléas et Mélisande (Lyon), several chamber operas by Guo Wenjing (Holland Festival, Paris, Frankfurt), and world premieres of operas by Micha Hamel (Snow White) and Willem Jeths (Hôtel de Pékin). His long and successful conductorship of the Nieuw Ensemble resulted in numerous premieres and tours, such as to festivals in Edinburgh, Berlin, Venice and Shanghai. As a symphonic conductor, Spanjaard has built a large orchestra repertoire in his years as Chief Conductor at the Limburgs Symphony Orchestra, with programmes dedicated to one composer each time (Messiaen, Ravel, Dvořák, Bartók), but also with special semi-scenic performances such as Debussy’s “Le Martyre de Saint-Sébastien” in which – at Spanjaard’s request - a new text and choreography were provided by Ramsey Nasr and Toer van Schayk respectively. Besides this, he has been a regular guest conductor at the Royal Concertgebouw Orchestra since 2001, where he has been invited several times for French music (Debussy, Dukas, Roussel), but is also appreciated for his approach to symphonies such as Brahms’ Second and Tchaikovsky’s Fifth. Spanjaard has successfully conducted, among others, the Dallas Symphony Orchestra, the Danish National Symphony Orchestra, the Munich Philharmonic, Ensemble Inter Contemporain (Paris), Ensemble Modern (Frankfurt) and the Klangforum Wien. During the official visit of the Dutch Queen Beatrix to Israel in 1995, he conducted a Mahler programme with the Jerusalem Symphony Orchestra. During the royal wedding of Crown Prince Willem-Alexander and Princess Máxima in 2002, Spanjaard provided the music as conductor and pianist. Spanjaard has conducted the The Hague Philharmonic Orchestra on several occasions, among which a memorable production of Verdi’s Aida in Amsterdam, and during recordings for the infamous series “400 years of Dutch music”. 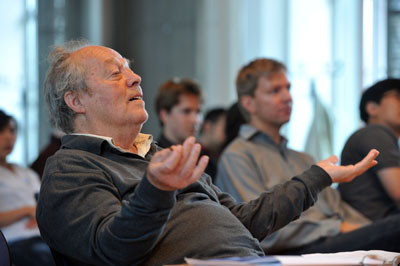 Since September 2012, Ed Spanjaard is main teacher in Orchestra Conducting at the Conservatorium van Amsterdam. In the coming years he is also one of the three principal guest conductors of the Orchestra of the Eighteenth Century. In the 2015-16 season he debuts at the Aalto theatre in Essen with Wagner’s “Der Fliegende Hollander”. "A terrific Masterclass led by the formidable team of Ed Spanjaard and Huba Hollókői. Ed's deep musicianship and experience was inspiring, and Huba's ability to analyse technique was exceptional. It is hard to think of a better teaching partnership. The orchestra's positivity and professionalism throughout the course created a very supportive environment for all of the students. A fantastic course." 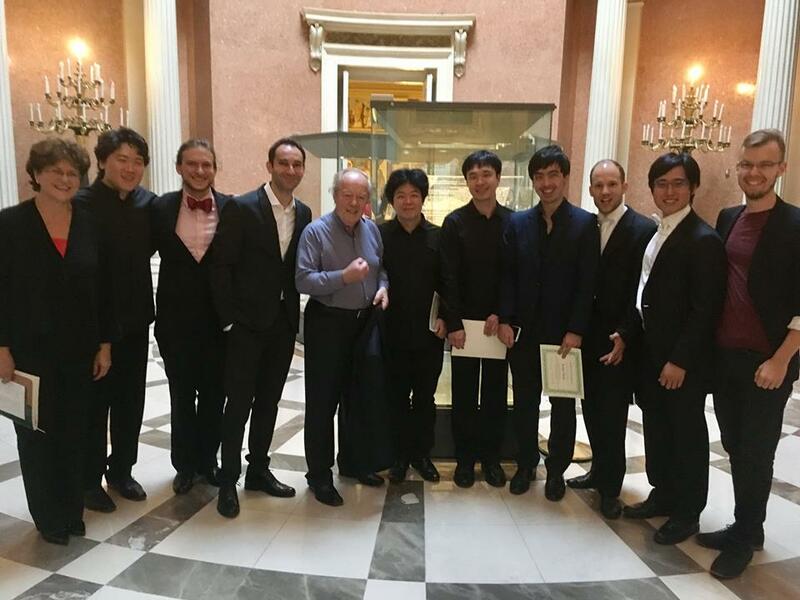 The MasterclassBudapest for Conductors with Professor Ed Spanjaard ended with a wonderful concert and a packed hall at the National Museum. We would like to thank all participants, the MAV Orchestra and Ed Spanjaard for their terrific music making, work and concentration! We hope to welcome you back next year! MAV Symphony Orchestra will be conducted by the participants of the masterclass. A MÁV Szimfonikus Zenekart a kurzus résztvevői vezénylik. 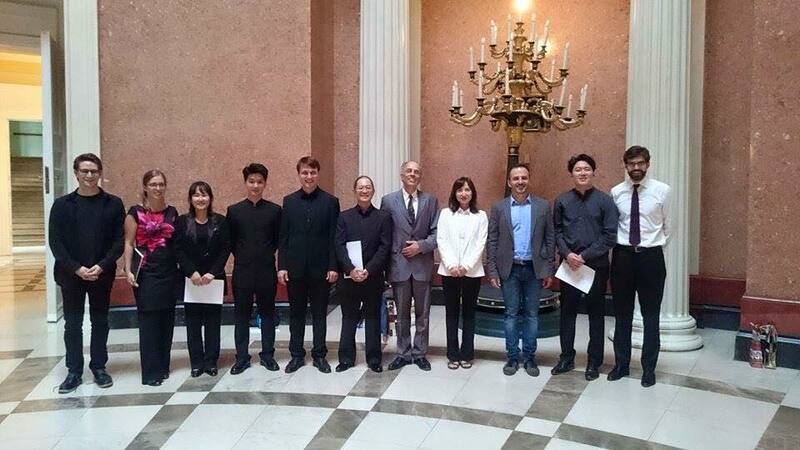 The application period for the MasterclassBudapest for Conductors in Budapest has ended. Thank you for the interest! We are happy to announce, that we have received a great number of applications from all over the world. Selected active participants will be announced after 15th of June. MAV Symphony Orchestra partner Hotel Mercure Korona offers discount rates for participants of the mastercourse. More information under the Conditions.